HS0099 - Site Map: Heritage Junction Historic Park. Color. HS7001 - Map of Partitioned Rancho San Francisco, 1-13-1870. HS7401 - Rancho San Francisco: Plat Map, June 1874. HB1717 - Southern Pacific Right-of-Way & Track Map; All Property Transactions in Newhall-Saugus Area, 1876-1992. AL1887 - USGS Map of Los Angeles County, 1887. HS9401 - William Lewis Manly's Death Valley Routes, Hand Drawn, 1894. Color. AP3011 - St. John's Subdivision (Newhall-Saugus), 1880s-90s. LW2560 - Oil Well Locations from Fillmore to Camulos, 1900. LW2855 - USGS: Buena Vista Lake Quadrangle, August 1912. HS2101 - Land Ownership, Santa Clarita - San Fernando - Simi Valleys, 1921. LW2118 - Map: Auto Road, San Fernando to Caswell's via Bouquet Canyon. LW2900 - Automobile Road Map: Los Angeles to Elizabeth Lake, 1922. LW3069 - Castaic High School Site: Jackson & Winkler Homesteads, 1922. NL2834 - Map of Newhall Land Property & St. Francis Dam Site, 3-24-1928. Map - Bowers Cave, Pyle Ranch, Indian Tribes. Desert Magazine January 1952. LW2624 - Saugus District, Angeles National Forest (Whole SCV), 1953. 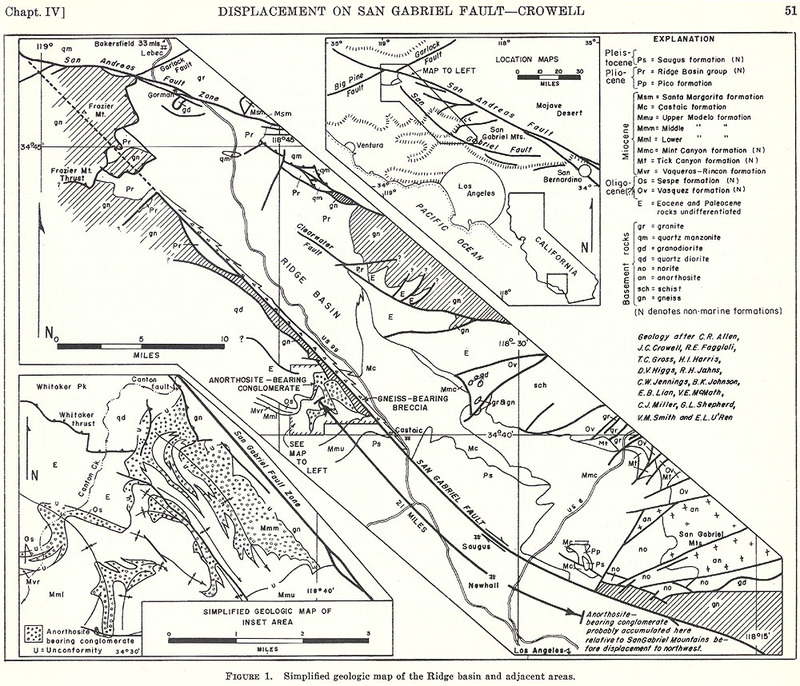 Fault Map - Displacement on San Gabriel Fault, September, 1954. AP2904 - Map: Rockhounding at Ravenna, Desert magazine, February 1957. TL6401 - Peachland Area of Happy Valley Development, Aerial View, 7-13-1964. SR9613 - Magic Mountain Amusement Park Map, 1971. RK7701 - Sonny & Cher Bono's Placerita Canyon Property, ca. 1977. HS7905 - Aerial Photo: Whites Canyon Road, 8-14-1979. LW8602 - Boundary Map of Proposed 90-Square-Mile City of Santa Clarita, 1-2-1986. SR8103 - Magic Mountain Amusement Park Map, 1981. LW2416 - Map of Ed Davis Park in Towsley Canyon (est. 1989/1992). SC9901 - Map of City of Santa Clarita, June 1999. LW2256f - Locator Map, Placerita Canyon Oil Seep (Historic Site of New Century Well No. 1), 2012. LW2361 - Rand Mining District Map (Mojave Desert). LW2382 - Powerhouse Fire Perimeter Map, June 2013. LW2611 - Lang: Nike Missile Battery; DTSC Cleanup Site, 2014. LW2767 - Map: Location of SPRR Humphreys Station. SCV Water Agency: Map of Electoral Divisions; First (Inaugural) Meeting Agenda • 1-2-2018. SCV Water Agency: Geographical Service Area • 2/2018.